Marilu Henner, the 65-year-old actress best known as the tough-but-tender redhead on the acclaimed TV sitcom Taxi, has written best-selling self-help books, been a radio talk-show host, and starred on Broadway. But she sees her most important work as keeping her husband, Michael Brown, alive. Brown was diagnosed with bladder cancer almost 14 years ago, and Henner has been at his side every step of the way. Here she talks to HealthCentral about how to be a patient advocate. She is joined by Arjun Balar, M.D., assistant professor of medicine at New York University Langone Medical Center, whose research into immunotherapy offers an exciting new treatment for advanced bladder cancer. HealthCentral: Marilu, can you tell us about when Michael was diagnosed with bladder cancer? So, he was diagnosed with bladder cancer and that set us off on a journey of creating a protocol for him. I’m happy to say he’s been in remission 13-and-a-half years. He didn’t have bladder surgery, chemo, or radiation. We wrote a book, Changing Normal: How I Helped My Husband Beat Cancer. After it came out, [the biotechnology company] Genentech got in touch and said, “You talked so much about caregiving in your book. We’d love to work with you to get the word out to other caregivers about how to have those difficult conversations.” Because they found that 62 percent of all people have trouble talking about bladder-cancer symptoms. It’s a below-the-belt condition, so people get a little squeamish. There’s this incredible website, www.BCAN.org, where you can find out more about our story as well as how to open the conversation. There’s a discussion guide for people who might be having a hard time talking to their loved one about bladder cancer. HC: Is there any advice from the guide you’d like to share now? Henner: First, use humor. There’s a lot that’s funny about talking about these kinds of intimate issues. Have an agenda when you see your doctor. Do enough research that you have a list of questions and don’t leave until you get your questions answered. Take copious notes or a recording device. And definitely get a second opinion. Some of the power has to go to the patients in terms of taking care of themselves. Michael changed the way he ate; he went vegan. He was a little stress bomb, so he started working on that with visualization. People hear what Michael did and they say, “Oh, my gosh, that was so hard!” I say, being healthy is hard, being unhealthy is hard, maintaining your health is hard. So pick your hard. HC: How common is bladder cancer? What are the signs and symptoms? Arjun Balar, M.D. : Bladder cancer is a relatively common cancer in the United States. It’s the sixth most common cancer overall and the fourth most common cancer in men. In fact, men are three times more likely to be diagnosed than women. About 80 percent of patients are smokers, either prior or current, and this also includes patients who are exposed to secondhand smoke. About 20 percent maybe have other risk factors, and this includes people who work in the chemical and dye industry, who will have chemical exposures that will increase risk. 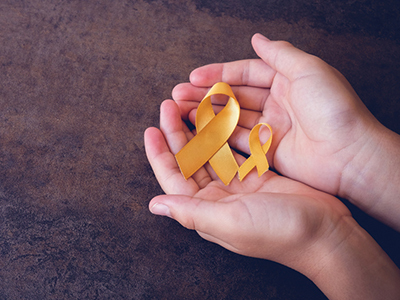 Less than five percent of patients may have hereditary bladder cancer, which means their families are at risk. Most patients will have blood in the urine, just like Marilu’s husband did. Some patients are diagnosed on the basis of microscopic bleeding, detected with a routine urine test in a yearly physical. Most patients are diagnosed with what’s called early-stage bladder cancer, which can be treated with scrapings inside the bladder as well as installing treatments inside. Unfortunately, about 20 to 30 percent of patients will have muscle invasive or metastatic bladder cancer. This is treated, if it is still in the bladder, with chemotherapy and radiation or surgical removal of the bladder. Advanced bladder cancer — in about 10 percent or less of patients — is incurable. HC: Is it true that bladder cancer generally affects elderly people? Dr. Balar: The average age is roughly 70 but I’ve had patients who were 94-years-young and I’ve also had patients who were 35. Henner: My husband was only 50. He was a merchant seaman right after college so he was exposed to a lot of chemicals. I know photographers are in a high-risk group too, as well as hairdressers and painters. HC: Dr. Balar, can you tell us more about immunotherapy? Dr. Balar: What we have seen over the last two to three years is a sea change in how we treat advanced or Stage IV bladder cancer. For the last 30-plus years, we have used chemotherapy. In fact, up until recently, the same chemotherapy we were using 30 years ago was what we were using here and now. What we have learned, though, is that bladder cancer is highly immunogenic, which means your immune system is ready to fight it. The immune system just needs a little bit of help. A new class of treatments called immune checkpoint inhibitors essentially stimulate the immune system so it can attack your cancer for you. What we have learned through a number of different trials is that these treatments are really effective and well-tolerated. Patients who respond have durable responses, which means the cancer shrinks and tends to stay that way. That is something we typically do not see with chemotherapy. In the last year we’ve had four FDA approvals of these agents. Henner: It always seemed counterintuitive to me that you would suppress the immune system and still expect the body to heal. So I’m glad bladder cancer is one of those target areas that can work with immunotherapy.